THANK YOU for your Advocacy on Behalf of EI/ECSE Services! We are grateful to everyone who wrote letters to their legislators, made phone calls, sent emails, and showed up in Salem last month! It's so important for our community to continue speaking up and sharing our stories in this pressure-filled legislative season. We're including a budget update below with more information that you can use when contacting your legislators. Advocacy can be as easy as telling your legislator your story, and asking them to fund EI/ECSE services. For people who want to get more in-depth about advocacy, you can find more information about building your message through the Ounce's toolkit, The Early Childhood Advocacy Toolkit. (It's available in English and Spanish.) We're including it as a resource here and on our Facebook page for anyone who'd like to use it! If you couldn’t join us for the EI/ECSE Advocacy Day on April 10, don’t worry. There is another advocacy day opportunity coming up on May 1! Plan to join us in Salem to advocate for EI/ECSE services if you can. The IDD Coalition and its GO! Project Advocacy team will be on hand from 10:00 am to 2:00 pm in room 257 of the Capitol Building to provide information, training, and support for your visits. Advocacy Day also includes an 11:00 am basic training on the legislature and meeting with your legislator that you might find helpful if you’re new to legislative advocacy. Make appointments with your legislators (you can find out who they are here), and plan to join us on May 1 for a great day of advocacy! Have you participated in our statewide photo rally yet? It's a super easy way to show your support for EI/ECSE services if you don't have time to come to the Capitol to meet with your legislators in person. Get your cameras ready and follow the instructions on the Oregon AEI website to participate! My son, Lex, has made great improvements in the time that he's been at the Tualatin Early Childhood Center. Every single staff member there that I've met has been nothing short of fantastic! 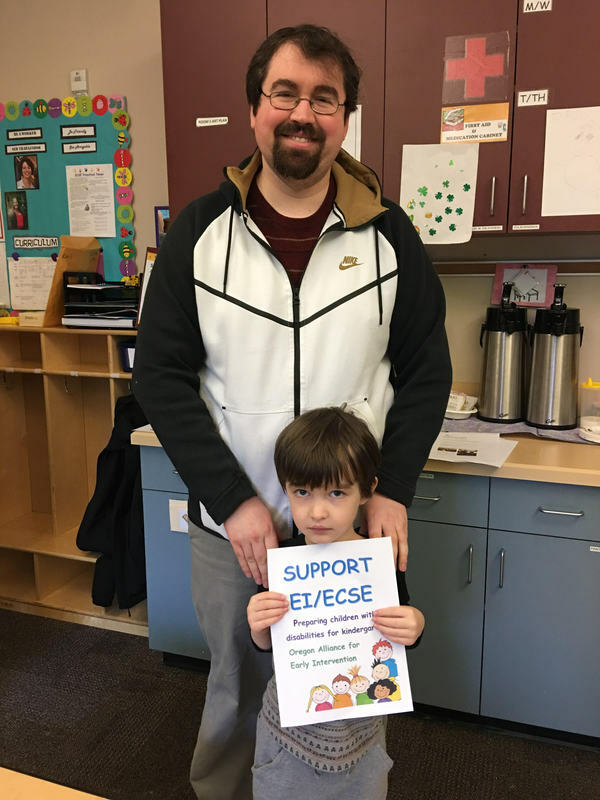 Between the parent training they offer and the eagerness of the staff to partner with me to help Lex, his development would surely be nowhere close to the level it is if he didn't have access to the services made available through the EI/ECSE programs. Have a EI/ECSE story to tell? Share it on our Facebook page! We are about halfway through the 2017 Legislative Session, and work on the state’s budget for the next biennium continues. This past week, the Co-Chairs of the Joint Committee on Ways and Means released the “Ways and Means Co-Chairs’ 2017-19 Target Reduction Lists.” This additional budget document from the Co-Chairs is a more detailed follow-up to their “Co-Chairs’ Existing Resources Framework Budget, 2017-19” that came out a few months ago. As with the previous high-level budget document issued by the Co-Chairs, this targeted reductions list was intended to inform a continuing conversation legislators are having about revenue and the budget actions that would need to be taken if no additional revenue for state programs and services is found this legislative session. The SubCommittees of the Joint Committee on Ways and Means will be using these budget projections as a starting point when they begin to prepare final agency budget recommendations, but there is still time for advocacy and these figures will also likely change when the State Economist releases the May 2017 Revenue Forecast on May 16, 2017. The good news is that EI/ECSE programs are funded at Current Service Level (CSL), although legislators do not appear to be adding any of the additional $60 million we are advocating for to bring EI/ECSE services closer to recommended levels of service. The bad news is that there are cuts across most other programs in the early childhood system that might also impact many of you. Working with our early childhood partners, we will be providing additional information for actions you can take to advocate in support of these early childhood programs in the coming weeks. When my son, Rory, was almost eighteen months, he had no intentional words, yet he could point to a letter and tell me its name. 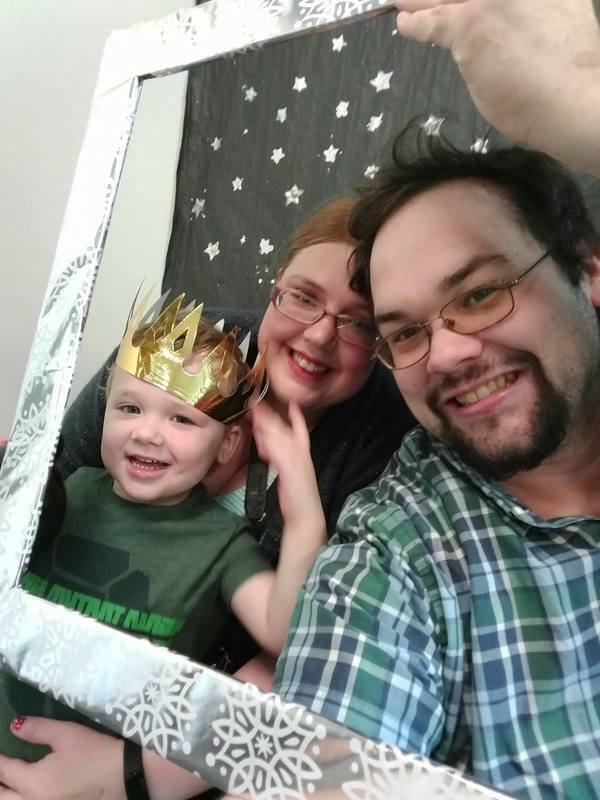 My husband and I had suspected for some time that our amazing little boy was not typical, but we held off on the doctor’s referral to Early Intervention services because we wanted to give him a little bit of time. At eighteen months, we finally took him in for an evaluation and discovered that along with the language delay we knew about, he had several other differences. Those differences would eventually be diagnosed as autism when he was two years and nine months old. Referrals to EI/ECSE Programs: How Does the Process Work? Have you ever wondered how children get referred to Early Intervention and Early Childhood Special Education (EI/ECSE) programs? A recent informational hearing gave a great glimpse into the process. 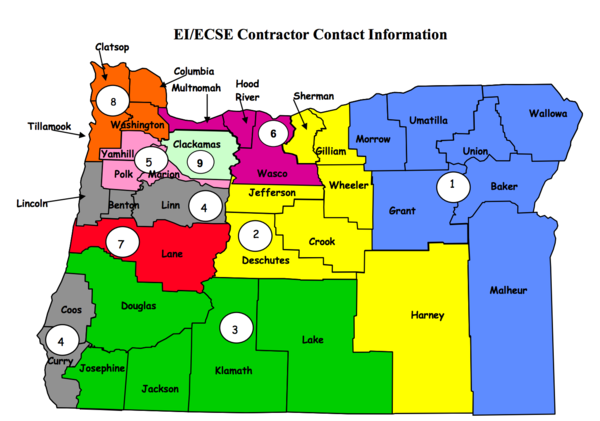 The State of Oregon is divided into nine different areas, each of which is served by an organization that is contracted to provide EI/ECSE services to that region. EI/ECSE providers in each service area have a responsibility to find every child birth to five who qualifies for services (their “child find obligation”). To do this, providers go to natural contact points for children and families in community, and tell them about services. 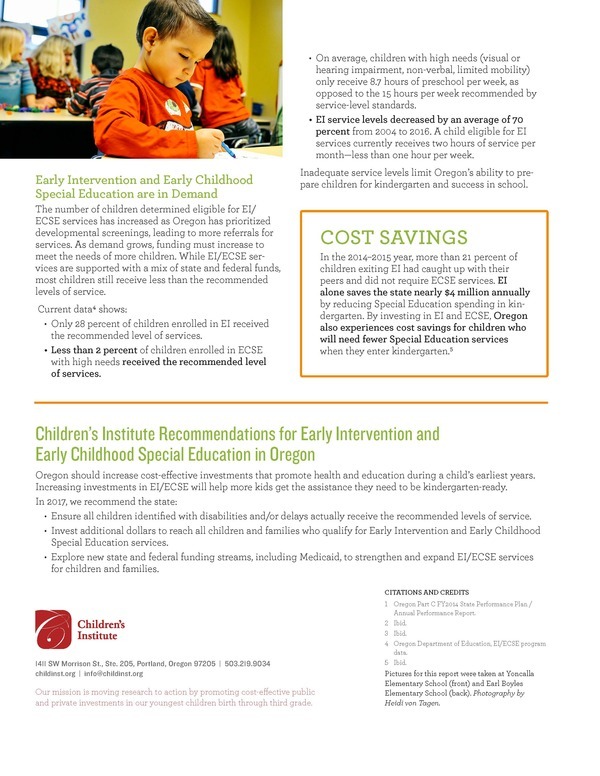 The Children's Institute recently put out a great fact sheet called "Early Intervention and Early Childhood Special Education in Oregon." It explains how EI/ECSE services serve Oregon children, and recommends that the state continue to support EI/ECSE services through increased funding. The Early Childhood Technical Assistance Center is offering a great webinar series that should interest anyone active in EI/ECSE! Sessions 1 & 2 have been archived on their website, so you can watch at your leisure. The next webinar will be on May 24 on the topic, "Infusing Partnership Principles and Practices into Family Engagement Activities." Click to sign up for this webinar! Children’s Institute has a vision that every child in Oregon is prepared for school and life. This year’s luncheon will feature a keynote from Professor Sean Reardon of Stanford University, a national expert on inequality in education. He will share the research that led him to become a strong advocate for investments in early childhood education. Reserve your free lunch spot here. This is the final OHSA conference in their three-part series. They will be featuring speakers from around the country, including Oregon, Washington, California, Arizona, Missouri, and Illinois. More information here. Oregon Department of Education, Oregon Health Authority, and the Early Learning Division are hosting their Annual Early Childhood Summer Institute! This is a great opportunity for high-quality professional development on topics relevant to working with children from birth through Kindergarten. ORO and PSU credits are available! Registration is now open. This year's conference theme, Play in a Standards Based World: Yes We Can! features leading experts in the field both at the state and international level. Find out more and register here.